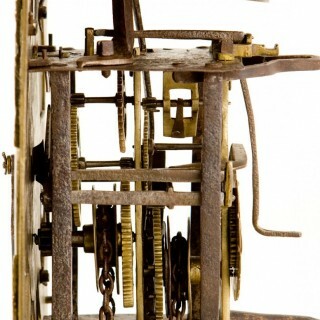 The iron and brass birdcage anchor escapement movement retains its original wheel and metal work and strikes the hours on a bell via an outside countwheel. The 10” brass dial has corner spandrels, original hands, diamond decoration to the dial centre and as ½ hour markers. 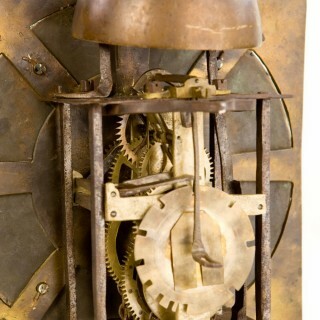 It retains its original hands and is fully signed on a small plaque beneath XII. Note: Illustrated in Quaker clockmakers of North Oxfordshire pg 78. Richard Gilkes was a prominent member of the Gilkes family, they were Quakers. He worked in Adderbury from around 1736 until his death in 1787 and was probably the originator of the zigzag dial. 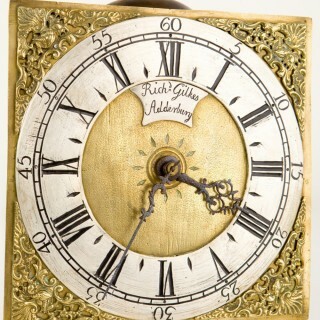 Extensive history of Richard and the extended family can be read in C. Beesons “clockmaking in Oxfordshire”. 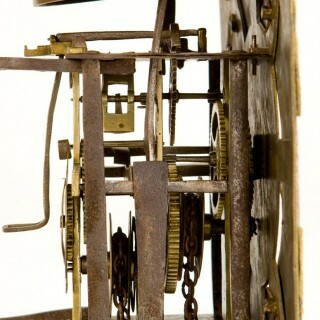 A good hook & spike 30-hr wall clock by Richard Gilkes Adderbury (Oxon) C1740.